Emmanuel Macron - Hiding in Plain Sight and/or Paving the Way? Emmanuel Macron - Hiding in Plain Sight and/or Paving the Way? Emmanuel Macron ? Pope Francis ? It’s true that the Antichrist won’t be revealed until after the rapture; however, no student of Bible prophecy can deny that the rapture and the Tribulation are at the door. Therefore, one must logically assume that he is at this moment hiding in plain sight. Yes, the brethren are to watch for Christ’s appearing to take us Home before that wicked one is revealed. But when one is looking up, one must also be aware of what is going on around them. As for the False Prophet, surely this man with “horns like a lamb but who speaks like a dragon” is hiding in plain sight as well. How are the left-behind going to know what to look for unless we give them some ideas based on what the Bible says? Aren’t we to be watchmen on the wall to warn people of the dangers? I fully intend to let those who may be left behind know who is paving the way for the prophesied one-world government and one-world religion that will ultimately be headed up by the Antichrist and the False Prophet, whomever they turn out to be. Before discussing two leaders who are playing a big part in the globalist agenda, we’ll see what the Bible says about the demonic duo that will be guided by Satan in the Tribulation. The Antichrist will rise suddenly from obscurity: “A little horn” (Daniel 7:8; 8:9). “He shall deal with the strongest fortresses with the help of a foreign god. Those who acknowledge him he shall load with honor. He shall make them rulers over many and shall divide the land for a price” (Daniel 11:39). He will rule a ten-nation confederacy: “And I stood upon the sand of the sea, and saw a beast rise up out of the sea, having seven heads and ten horns, and upon his horns ten crowns, and upon his heads the name of blasphemy” (Revelation 13:1). You can read about “The Prophecy of The Ten-Nation Confederacy” here. It also describes the apostate one-world church that is supported by the one-world political government. At first, the Antichrist will appear to be a man of peace by “confirming a covenant with many” (Daniel 9:27). But midway through the seven-year-tribulation, the Antichrist will desecrate the rebuilt temple, proclaim himself to be God, and use his army to conquer; he will go after the Jews and also those who turn to Christ during the Tribulation and refuse his mark of worship (Tribulation saints). “And it was given unto him to make war with the saints, and to overcome them: and power was given him over all kindreds, and tongues, and nations” (Revelation 13:7). Emmanuel Macron was born to non-religious, liberal parents but decided to become a Catholic at the age of 12. He received a Jesuit education until his last year of high school. He worked as an Inspector of Finances in the French Ministry of Economy after graduating from an elite college in 2004. His mentor, Jean-Pierre Jouyet, gave Macron an accelerated course of training. Macron was also groomed by the Rothschilds and even attended a Bilderberg Summit in 2014. He worked as a Rothschild investment banker (where he became a millionaire) and later as a Socialist party government minister. Many news reports speak of his meteoric rise from obscurity. He is France’s youngest head of state since Napoleon and the youngest president in France’s history. He’s been described as charismatic, a flatterer, intriguing, and arrogant. He is respected by European elite leaders, so much so that he appears to be the de facto leader of the European Union. He was even called Europe’s Savior. The idea of a ten-nation coalition was in the planning stages before Macron became France’s president. Macron said he plans a “Jupiterian” presidency (like the Roman king of the gods, Jupiter, who carefully weighed his pronouncements). Another worshiped god of the Romans was Janus, who was often invoked together with Jupiter. Who was Janus? “The Jupiter theory contends that the president is the supreme authority…His authority depends on the scarcity of his words. While Macron mentioned Jupiter, he deliberately failed to mention Janus – commonly known as the ‘God with Two Faces’…Other than the blatant pagan worship, ancient Roman traditions declare that Jupiter cannot exist without Janus… Jupiter is first in order of importance, sure, but second to Janus in order of time. Macron has been criticized for taking an arrogant approach, such as when he didn’t conduct the traditional French presidents’ Bastille Day TV interview because his thoughts are “too complex” for such a forum. Due to the backlash, he has now decided to make himself more open to his subjects. Paul Zajac, a visiting fellow at the American Enterprise Institute on leave from the French diplomatic service, said of Macron, “Many people, especially here in Washington DC, tend to see him as a white knight of the liberal world order who challenges Trump and populism.” In other words, Macron shares the global government agenda of the DC liberal politicians that President Trump is against. That’s why they’re so desperately trying to take Trump down. They want to wrest total power back so they can finish off the US and bring their global agenda into fruition. This week, Macron traveled to Aachen, Germany to receive the prestigious Charlemagne Prize. What’s that all about and what is the significance? As the Roman Empire was falling apart, the Franks (a Germanic tribe in present-day Belgium, France, Luxembourg, the Netherlands and western Germany) moved their homes into the Roman Empire. By 700 AD they were the rulers of Gaul and a large part of Germania east of the Rhine. They protected the papacy and the Roman Catholic faith. Charlemagne spread his empire across much of Western Europe through many wars in establishing the “Holy” Roman Empire. He was known for using his sword named Joyeuse in all thirty years of war and the 18 battles in which he fought. He had thousands killed who failed to convert to Catholicism. He was dubbed the ‘father of Europe’ and was a role model for Napoleon and Hitler, both of whom had visions of ruling a unified Europe. Napoleon is considered by some to be the first Antichrist, and Hitler is considered to be the second Antichrist. Napoleon saw himself as a second Charlemagne, even to the point of declaring “I am Charlemagne.” Napoleon even chose Emperor Charlemagne’s Roman tomb sarcophagus to accompany him on his triumphal procession through Paris in 1798, followed six years later when he had himself crowned Emperor by the pope. The Charlemagne Prize, considered today to be “the Oscar in politics,” has been awarded to the founders of the European Union as well as various politicians and “dignitaries.” Former president Bill Clinton wanted to build up a power in Europe, and he received the Charlemagne Prize in 2000 for doing so. It was awarded to Pope Francis in 2016 “for his moral authority in defending the fundamental values of the EU.” The communiqué on the International Charlemagne Prize award states that the Pope sends a message of mercy and tolerance and underlines the need for European unity and solidarity. Germany’s Chancellor Angela Merkel, a former recipient of this award, was at Macron’s Charlemagne award presentation as were other European dignitaries who have received the award. She said of Macron, “He has clear ideas on where and when Europe needs to evolve and has the capacity to inspire young Europeans.” Macron praised Europe in his acceptance speech for maintaining 70 years of peace. He also presented his vision for the future, calling for more unity among member states. Macron went to a Catholic mass just before attending the award ceremony. British and American leaders have actually helped build a modern resurrection of the “Holy” Roman Empire. The Roman Empire may have fallen centuries ago, but it didn’t really die; it just changed into a mystery form—from political to “religious,” lead by the Roman bishops who had by then gained much power and influence. They even kept the emperor’s title of “Pontifex Maximus” as is shown here carved on a statue at St. Peter’s Basilica (8:51 mark. Warning: the video of the inside of St. Peter’s Basilica is chilling). Several Catholic institutions claim to have either the head of John the Baptist or various parts of his skull or body. Even the Grand Mosque of Damascus, Syria claims to have the head of John the Baptist and claim it has powers. See the various photos and read about these claims here. In his autobiography Pilgrimage to Rome, Bart Brewer (ex-priest and head of Mission to Catholics International) said, “Even Martin Luther wondered how there could be twenty-six apostles buried in Germany, when there were only twelve in the entire Bible! It is said that if all the pieces of the cross displayed in Catholic churches were assembled together, it would take a ten-ton truck to carry them. It is clear that most ‘relics’ are frauds. Furthermore, there is nothing in the Bible that supports the veneration of relics, even if they are genuine” (page 132). The early church was not the Roman Catholic Church, and Peter was never a pope. The early Christians were persecuted horribly by the Roman government during the Roman Empire, and this didn’t stop during the “Holy” Roman Empire. Those who tried to get the Bible into the hands of the laypeople so they could read it for themselves were killed. The Protestant Reformation was a widespread revolt against the abuses and totalitarian control of the Roman Catholic Church and its unbiblical practices. Pope Francis is trying to rein everyone in to the Catholic church, embracing all religions and the non-religious, leading them all to believe there are many paths to God. He believes that you will be saved just by being “good” or doing “good works.” And of course those works must be done in the Catholic church. But what does the Bible say? “Jesus saith unto him, I am the way, the truth, and the life: no man cometh unto the Father, but by me” (John 14:6). “For by grace are ye saved through faith; and that not of yourselves: it is the gift of God: Not of works, lest any man should boast” (Ephesians 2:8). The church is the body of believers in Christ of which He is the head, not the pope. “And God placed all things under his feet and appointed him to be head over everything for the church, which is his body, the fullness of him who fills everything in every way” (Ephesians 1:22-23). 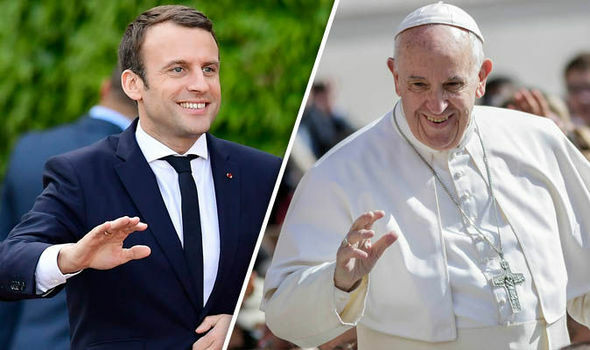 No one can deny that both Emmanuel Macron and the pope are paving the way for the future leaders of a one-world government and a one-world religion. Revelation 13 warns against both, which will be headed by the Antichrist and the False Prophet. And Revelation 17 warns us of the one-world Mother of Harlots “Mystery” Babylon religion that will be headquartered in Rome. All false religions have their roots in the original false religion that was begun in Babylon. “Children it is the last hour, and as you have heard that antichrist is coming, so now many antichrists have come. Therefore we know that it is the last hour” (John 2:18). Ultimately, man’s swords and crowns will mean nothing when the King of kings and Lord of lords, Christ Jesus, returns to Earth. “And out of his mouth goeth a sharp sword, that with it he should smite the nations: and he shall rule them with a rod of iron: and he treadeth the winepress of the fierceness and wrath of Almighty God” (Revelation 19:15).